Editor's note: This article is an excerpt from the brand-new book Sound Pictures: The Life of Beatles Producer George Martin, The Later Years, 1966-2016 by Beatles historian Kenneth Womack. Sound Pictures is the second and final volume in Womack's series on Martin. Maximum Volume: The Life of Beatles Producer George Martin, The Early Years, 1926-1966 was released last year. The selection below picks up at a pivotal moment in the band's approach to recording. Having just completed tracking "Paperback Writer," the Beatles got to work on what would be the single's B-side, "Rain." The novel studio techniques they began to employ, as well as the elevated mental states they explored, would expand and blossom in their next full-length album, Revolver, with the Summer of Love, Sgt. Peppers, and Magical Mystery Tour yet in the offing. Sound Pictures is available now. As it turned out, there was no rest for the weary when it came to George and the bandmates. As with "Paperback Writer," "Rain" promised to continue George and the group's ongoing efforts to expand the capabilities of the recording studio. 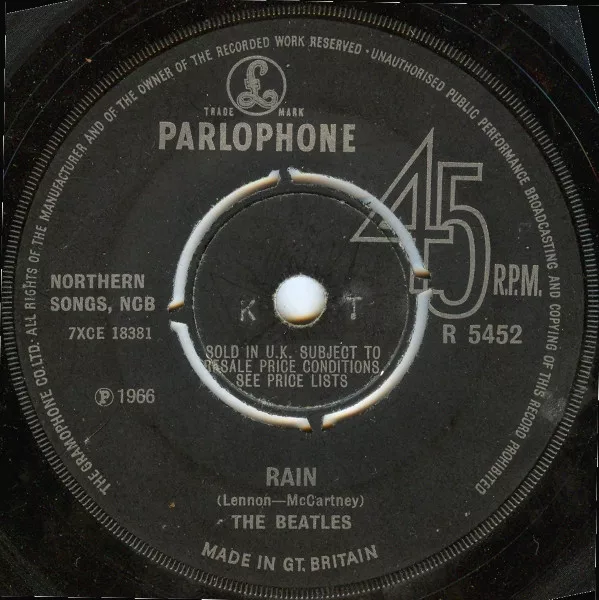 As John's entry in the sweepstakes to land the A-side of the next singles release, "Rain" had already been slated for the B-side of "Paperback Writer" by the time that it saw its Abbey Road debut during the evening session of Thursday, April 14. Like "Mark I," "Rain" found its origins in Lennon's recent forays into The Psychedelic Experience, particularly Leary's philosophy of being: "Whether you experience heaven or hell," Leary instructed his reader, "remember that it is your mind which creates them. Avoid grasping the one or fleeing the other. Avoid imposing the ego game on the experience." For John, "Rain" afforded him with the opportunity to espouse his personal belief in the inherent value of pure human experience. The Beatles - "Paperback Writer" b/w "Rain"
With the tape rolling, Martin led the bandmates in a rehearsal of Lennon's latest composition. As they prepared a basic track, McCartney continued the heavy bass sound that Emerick had facilitated with "Paperback Writer." Nevertheless, as the band pushed forward, they couldn't settle on a groove. The song seemed lifeless to them, as if it were missing an essential element. And that's when Martin hit upon the idea of manipulating the recording's tape speed in order to imbue the song with an unusual sonic palette. To accomplish the effect, he instructed Emerick to record the band's performance on a sped‐up tape machine. They managed to capture this sound across five takes, with Harrison and Lennon's guitars and Starr's drums on track one and McCartney's bass on track two. At this point, the song's basic rhythm track took on a languid, more lethargic mien. With this effect in place, Martin recorded Lennon's lead vocal on track three. But even still, the process was far from complete. During post-production, Lennon's voice would be slowed down perceptibly, which would ultimately result in his lead vocal seeming slightly fast on the master recording. In this way, Martin's recording of "Rain" reveals a unique arrangement, with different elements of the finished track being drawn from performances that had been captured at varying tape speeds. 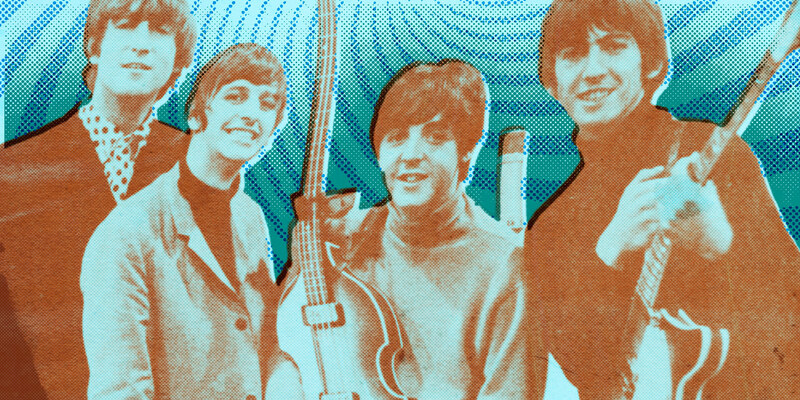 But as with so many of the Beatles' latest compositions, there were more surprises in store. With "Rain," the surprises began with Lennon back home at Kenwood and ended with Martin in the Abbey Road control room. After George and the Beatles concluded the "Rain" session in the wee hours of April 15, Phil McDonald prepared a reel-to-reel tape copy of the unfinished song for John to take home. When he returned to Kenwood, the Beatle—being stoned at the time after the long, chauffeur-driven ride back home from the city—mistakenly thread the tape backward into his home machine. But as he listened to the playback in his narcotized state, he was confronted with the unexpected sound of hearing his voice blaring back at him in gibberish as the tape unspooled in reverse. In Lennon's version, which he recounted several times over the ensuing years, he adored the effect upon that very first experience. Yet according to Harrison, Lennon's account wasn't entirely accurate. When the Beatles left the studio that night, each of the bandmates were given a reference tape to take home with them. Only Phil hadn't properly rewound the tapes before handing them over to the departing Beatles. This fact had slipped Lennon's mind by the time he returned to Kenwood. The Beatles filming a promo video for "Paperback Writer"
"I got home from the studio and I was stoned out of my mind on marijuana," Lennon later recalled. At this point, Harrison's account jibes with Lennon's, as Lennon apparently experienced an epiphany about adopting such an effect during the next session, where Martin and the group were scheduled to continue working on "Rain." What happened next, at least in Lennon's version, was that "I ran in the next day and said, 'I know what to do with it, I know... Listen to this!'" Yet according to Martin, neither Lennon's account, which was later echoed by Emerick, nor Harrison's was true. Rather, the idea of intentionally manipulating recordings by playing them backward had been in Martin's bag of production tricks for many years. Back in 1962, he had even collaborated with the BBC's Radiophonics Workshop laboratories in the creation of a moderately successful single titled "Time Beat" and credited to Ray Cathode, Martin's pseudonym for the project. In the producer's account of the "Rain" tape-manipulation episode, it was Martin himself who suggested that they experiment with backward recording. In a similar vein to the episode back in October 1965 in which he had waited for an opportune moment to deploy his windup piano effect on John's "In My Life," George took advantage of a session break to tinker with John's latest creation. "I was always playing around with tapes, and I thought it might be fun to do something extra with John's voice. So I lifted a bit of his main vocal off the four‐track, put it onto another spool, turned it around and then slid it back and forth until it fitted. John was out at the time but when he came back he was amazed. Again, it was backwards forever after that." The tape segment in question featured John's lead vocal track in which he sang the song's opening line, along with the phrase "sun shines rain," which George had lifted from the second verse and the chorus. With the tape reel in hand, George overdubbed the thirty-second segment onto the tail end of the song. Martin's words about the Beatles' growing penchant for experimentation—"it was backwards forever after that"—would prove to be very prescient indeed. Harrison, for one, was ecstatic over the possibilities that backward recording entailed. 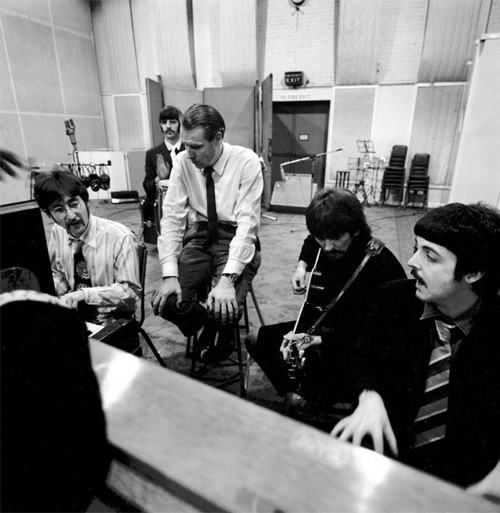 With "Rain," "George Martin turned the master upside down and played it back. We were excited to hear what it sounded like, and it was magic—the backwards guitarist! The way the note sounded, because of the attack and the decay, was brilliant. We got very excited and started doing that on overdub. And then there was a bit of backwards singing as well, which came out sounding like Indian singing." 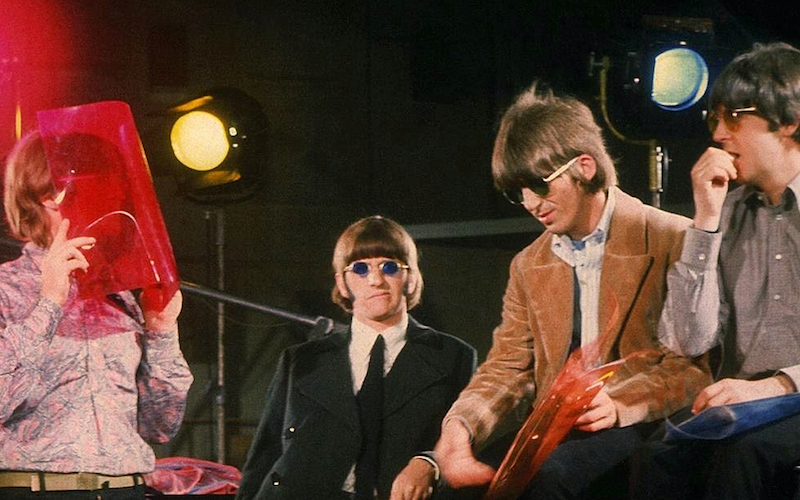 As Geoff later reported, tape manipulation very quickly became the norm for John, Paul, George, and Ringo. When they finished a new song, one of the Beatles inevitably said, "'Okay, that sounds great, now let's play it backwards or speeded up or slowed down.' They tried everything backwards," Geoff remembered, "just to see what things sounded like." Disc cutter Tony Clark was hardly surprised by the bandmates' newfound adoration for backward recordings. "It's because of the enveloping of sound," he later recalled. "It draws you in. It's like someone putting their arms around you." During the next session, a protracted, eleven-hour affair that was held in Studio 2 on Saturday, April 16, Martin and the Beatles created further refinements to "Rain," including the addition of ADT to Lennon's vocal as recorded during take five. This resulted in an audible slowing down of his voice, as noted previously. According to Geoff, "An offshoot of ADT was that we had a big audio oscillator to alter the frequency of the tape machines. We would drive it through a power amp and the power amp would drive the capstan wheel and enable you to speed up or slow down the machine at will. John—or George if it was his song—used to sit in the control room on mixes and actually play the oscillator." In addition to the tape manipulation of John's voice, the day's session witnessed the superimposition of tambourine and backing vocals. And with that, the "Paperback Writer" backed with "Rain" single was complete. But after "Rain," the die had truly been cast: from henceforward, George and Geoff observed the Beatles clamoring for more and greater sonic effects, affording the producer and his gifted engineer with one new challenge after another. For more first-hand accounts and insights in the Beatles' production, order Sound Pictures here.